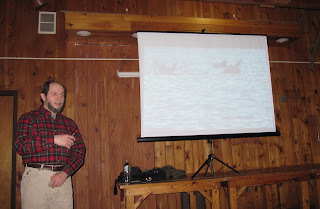 In the event you missed it last month, the famous Adirondack Moose Whisperer and resident biologist, Ed Reed, will deliver his popular "Moose on the Loose" presentation this Sunday afternoon March 28, 2010, at the Adirondack Museum in Blue Mountain Lake, N.Y. As you may have figured out from his Adirondack Lifestyle blog moniker, my husband, Ed, is a wildlife biologist with the New York State Department of Environmental Conservation Region 5 office in Ray Brook, New York. Ed frequently speaks about how large mammals, other than humans, also enjoy the Adirondack Lifestyle. Here is a bit about him and the upcoming event from John over at New York History. I have to be careful not to brag about how great Ed is since I could be seen as a tad biased. The presentation is quite interesting if you like natural history and animals. For example, it is interesting to note moose really do swim to New York across Lake Champlain from Vermont. By the way, I will give an Adirondack Candy Man chocolate moose lollipop to the person who comes to the presentation and asks Ed if moose have webbed feet. If you haven't heard him speak about moose, this weekend's program might be a good one to attend. Due to New York State budget problems, this is the last time for the near future when Ed will have budget approval to travel for public presentations. I figure by the time the New York State budget is fixed, Ed will be retired, so this Sunday's program might be a mental collector's item. The program will be held in the Auditorium at the Adirondack Museum, and will begin promptly at 1:30 p.m.
Moose whisperer photo courtesy of Joann Sandone Reed. My husband and I enjoyed the moose lecture at the museum today, it was very informative. I was disappointed he mentioned the web footed moose question before I had a chance to ask it though! Just kidding of course, he did a great job. I am so sorry you did not get your lollipop! Ed said he knew he had made a mistake as soon as the words were out of his mouth about web-footed moose. Although he ruined my joke, he did such a good job that I shared the lollipop with him on the drive home. Nice to hear you enjoyed the presentation. Thanks for attending, and for reading! Yeh, I sure would have liked to hear/seen the presentation -- 'little hard to do from central PA.